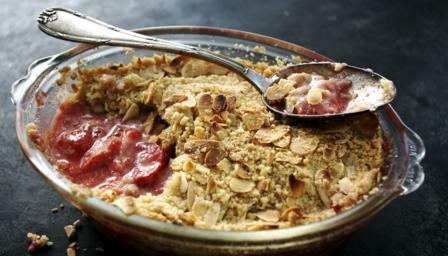 This is a crumble of dreams. This is nothing short of alchemy: you take the vilest, crunchiest supermarket strawberries, top them with an almondy, buttery rubble, bake and turn them on a cold day into the taste of English summer. Naturally, serve with lashings of cream: I regard this is as obligatory, not optional. For this recipe you will need 1 ovenproof pie dish approximately 21cm/10in diameter x 4cm/2in deep (approx. 1.25 litre/2 pints capacity). Preheat the oven to 200C/400F/Gas 6. Put the hulled strawberries into your pie dish (I use a round one) and sprinkle over the sugar, almonds and vanilla extract. Give the dish a good shake or two to mix the ingredients. Now for the crumble topping: put the flour and baking powder in a mixing bowl and rub in the cold, diced butter between thumb and fingers (or in a freestanding mixer or food processor). When you’ve finished, it should resemble rough, pale oatmeal. Stir in the flaked almonds and demerara sugar with a fork. Tip the topping over the strawberry filling, covering the strawberries in an even layer and pressing the topping in a little at the edges of the dish. Set the dish on a baking sheet and bake in the oven for 30 minutes, by which time the crumble topping will have darkened to a pale gold and some pink-red juices will be seeping and bubbling out at the edges. Leave to stand for 10 minutes before serving, and be sure to put a jug of chilled double cream on the table alongside.